Schiphol Airport is the main international airport of The Netherlands. 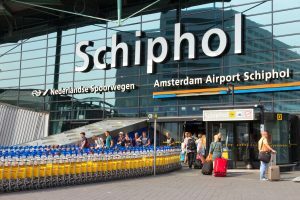 In terms of passengers Shiphol is the third most busiest airport in Europe. Public Transport from Schiphol Airport into Amsterdam or the rest of Holland is easy. In addition to paper tickets, many Dutch people use a public transport card called the ‘OV-chipkaart’. You can use the OV-chipkaart on the train, bus, tram and metro services. Several different types of public transport cards are available – read on to find out more. With the Amsterdam Airport Express ticket you can travel easy from Schiphol Airport to the city centre of Amsterdam. The bus takes only 30 minutes from Schiphol Plaza to the centre of Amsterdam (Leidseplein). There are 6 buses each hour. Return journeys do not have to take place on the same day. Museumplein (28 minutes), Rijksmuseum (32 minutes), Leidseplein (34 minutes) and bus station Elandsgracht (38 minutes). Departs every 10 minutes (between 7 am and 6 pm) or every 15 minutes before 7 am and after 6 pm. The Amsterdam Travel Ticket allows you to travel limitless from the international airport Schiphol to Amsterdam by train and in Amsterdam – day and night – on bus, tram and metro, for 24, 48 or 72 hours for € 17,00, € 22,50 and € 28,00 respectively. The greater Amsterdam area offers so much more than just the big city sights. The Amsterdam & Region Travel ticket lets you explore the beaches of Amsterdam, Edam’s cheese market, the Aalsmeer flower auction, Keukenhof Gardens and traditional villages like Volendam and Zaanse Schans with a single 24-hour public transport pass. When you purchase this ticket, you’ll also get a public transport guide for the Amsterdam region (PDF) filled with useful tips and sightseeing highlights. A disposable paper ticket is probably the best option if you only plan to use the train, bus, tram or metro once. However, the OV-chipkaart can save you money if you plan to use the train, bus, tram or metro more frequently. You can credit these cards with funds here at our shop. It’s easy to buy an OV-chipkaart at a station. Just follow the on-screen prompts at the yellow ticket machines, or ask for one at a service desk. At Schiphol, the ticket machines are located right next to the escalators that descend to the train platforms. It’s important to always check-in and check-out when you travel. It’s easy – you just need to swipe your card at the yellow card readers. 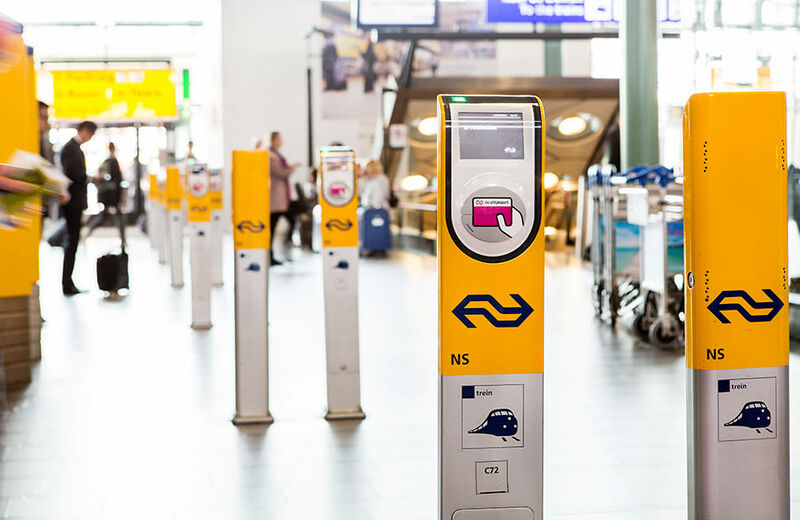 At Schiphol, the designated yellow card readers for the trains are located at the top of the escalators and lifts inside Schiphol Plaza. A quick tip – you need to swipe your card before you board the train and metro. For the bus and tram, you swipe them after you are on board.